This page provides valuable information about meeting minutes, and will assist you in streamlining meeting minutes procedures within your organization. Meeting minutes are the instant written record describing the discussions, decisions and action items that take place during a meeting. There are 3 main styles of meeting minutes. These are discussed later in this document; however it is important that in all scenarios, a note taker is designated prior to starting the meeting. Certain meeting types, such as committee meetings or board meetings require certain elements to be included in the minutes document, as well as a certain format be followed. It is important that this is also arranged prior to starting the meeting. If you are struggling with meeting minutes, the use of meeting management software like MeetingBooster simplifies this process, adding accountability and consistency, increasing overall effectiveness. If you have ever searched for a meeting minutes sample, you may find various examples online from real life meetings. The problem is that a meeting minutes document is based on an agenda, and agendas are usually more specific, relating the company that created it. 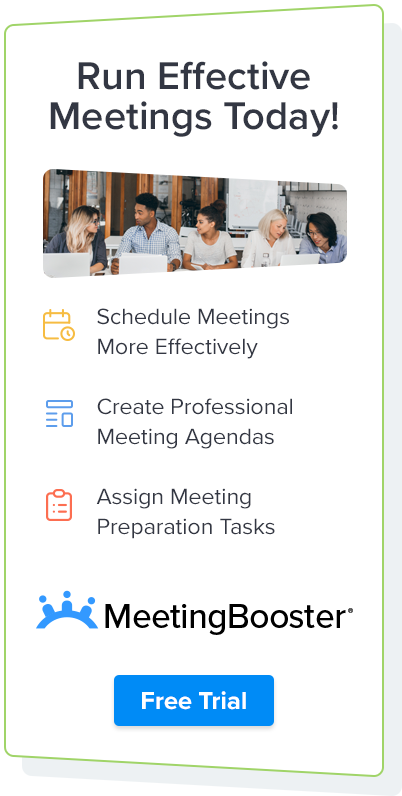 Since all meeting minutes documents will then be specific to the company and that meeting agenda, here is a meeting minutes sample made by meeting management software called MeetingBooster. Download this meeting minutes sample here! Regardless of the chosen meeting minutes style, it is important that you note the start time, attendee's present and any opening remarks. As the meeting progresses, it is the note takers responsibility to capture all important information covered during the meeting. It is sometimes difficult to accurately capture these topics, which is why the use of software is becoming more popular. Since the meeting minutes follow the meeting agenda topics, it is important that the note taker has a copy of the agenda, or that it is made visible throughout the meeting. The note taker may need to move forward and backward through the agenda to recap on import topics, or to tie new discussions to previously covered topics. As decisions are made, it is important that the note taker document the decision, and who made them. If there are any action items, it is the note takers responsibility to clearly define the task, any expectations, timeframes and the person or team responsible for completing the task. In some cases, the note taker will distribute the action items as a part of the meeting minutes, or directly to a manager or responsible party. Although many organizations use a standard word processing programs like MS Word, meeting management software like MeetingBooster are becoming more standard. MeetingBooster allows the note taker to quickly enter notes based on a formalized agenda. Each topic can be selected, the corresponding attendee making a comment can be noted and any decisions made can be identified. The note taker can navigate back and forth through the agenda as needed, and easily synch back up with the presenter with a simple mouse click. Action items are easily identifiable, are dynamically entered into the meeting minutes document and even distributed to the responsible party. Simplify how to take minutes using MeetingBooster. When the meeting is adjourned, it is the note takers responsibility to review and finalize the minutes. Traditional programs like MS Word make this process tedious, and there is redundancy due to the note taker having to re-type the captured information into a more formalized meeting minutes document containing company logos, formatting, etc. It must be easy for the meeting minutes document to be distributed, and in some cases must be archived. Standard email systems or intranet environments make the distribution of meeting minutes easier; however there is no guarantee that the correct people will get the minutes. Having all of the pertinent email address may be a problem if attendees are invited outside of your organization, or not present for the meeting. It is important that the note taker review the proposed attendee list, the revised attendee roster taken at the start of the meeting, and be aware of any other non-attending parties that will require the minutes, such as a C-level manager. When using meeting minutes software, this process is automated. The attendee list is pre-made, attendance is taken at the start of the meeting, and all email address are logged into the system based on the initial meeting invitation or are added on the fly prior to starting the meeting. meeting minutes documents are created using professional layouts, capturing all important information and organizing it in an easy to review format. Users can distribute the minutes to attendees and teams with a few clicks and the documents are archived for future access and review. Finalize and distribute minutes with MeetingBooster.